After the initial post on bibliophilia [here], and book shops in Nagpur [here] and Pune [here] we now come to the third in this series. The city of Mumbai [formerly known as Bombay] . There is too much to write about Mumbai, the way it was, it is and it will be in the future to come. Since it is my current location since about three years, and it is to be so for the coming few years, I have developed a special bond with the city. When I was in Pune, I had come quite a few times to Mumbai, with one of my friends who belonged here. 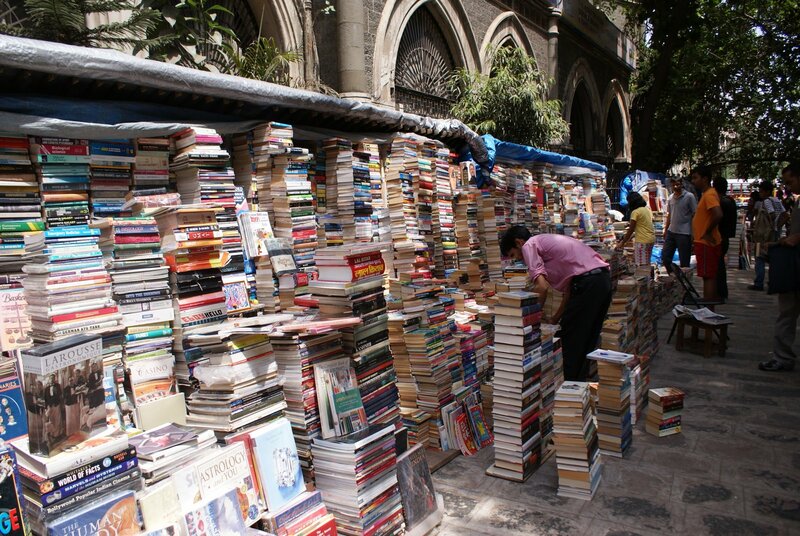 It was during my visits in those years that I came to know about the Old/Used book markets in the city. The first one which I will describe is in the heart of the Mumbai, The Fort area. Currently there is no Fort in this area, but there was in the early days of Nineteenth Century. The Fort has long gone since then, for making space for civilian and other buildings, and now only the name remains. There are too many things in the small area which are of interest to me. I cannot maybe describe them all in this blog. Maybe, The Fort, needs a blog entirely for itself. But lets not divulge too much into it, as right now the thing that we are interested in are the Candy Shops for Bibliophiles. 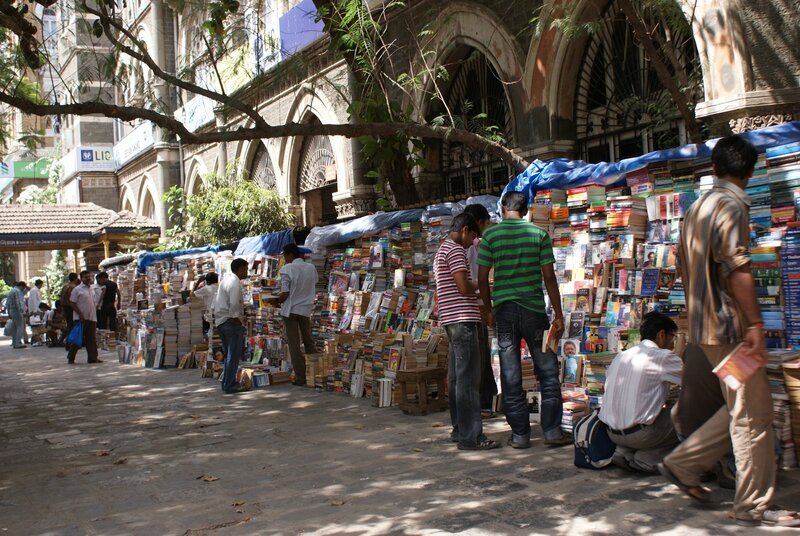 The Fort area presents the bibliophiles with a wide opportunity to shop, right from the old/used books to one of the quite old shops in Mumbai the Strand Books. I recommend that you start from the CST [Chatrapati Shivaji Terminus formerly known as Victoria Terminus or VT] and take on the D N Road [Dadabhai Nowrojee Road]. Start walking from the Western end of the road, the end at which Mc Donalds is present. Almost right up to the Flora Fountain, one finds a sort of subway created by the arches of the buildings of Victorian architecture. Along these corridors there are a lot of proper book stores. Some notable among them are the Computer Book Shop, Bookzone, Ashish Book Stores. See the map below. Ashish Book Stores also have a annual exhibition in which you get lot of books at heavily discounted prices. 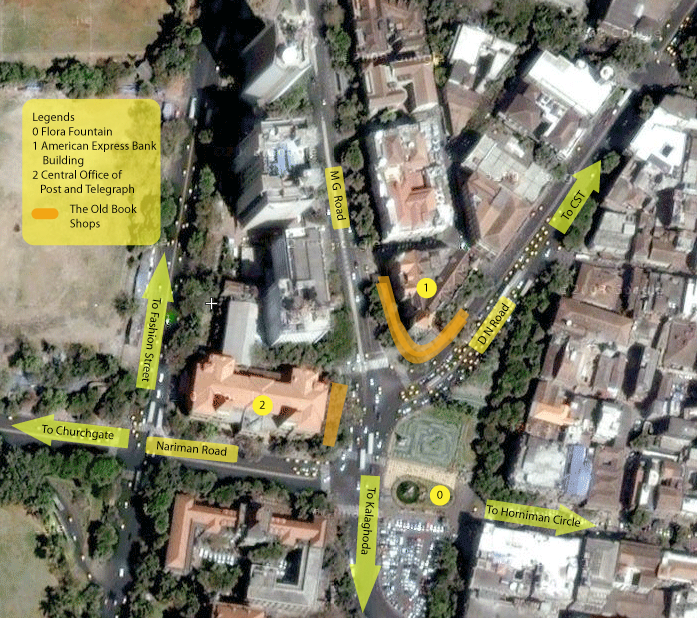 Usually the book fair is at the Sunderbai Hall, near Churchgate. On the other side of the road is the Sterling Book Stores, which will give you an enormous variety of technical books to get. They have substantial sections on Physics, Mathematics, Philosophy and Psychology. In most of these shops you will get about upto 10-15% discount on the list price. Along the corridor you may find one or two old book sellers. One at very beginning and one may be in the middle of the passage. They were frequent a few years back. I got my copy of Albert Einstein : Philosopher and Scientist here in these shops. In fact a lot of old booksellers were present till a few years back, most of them now being removed, I guess in the anti-encroachment drive. But the walk through these ‘corridors’ is worth for the books that await you at the end of this walk. You can drop by to the Khadi Bhavan, which is on the way to do some nice shopping. If you take a left turn at the Khadi Bhavan Chowk, it will lead you to Strand Booksellers. They have good collection of books on all subjects. You won’t find too technical books here, but books for general reading are more than abundant. Every year Strand people have the Strand Book Festival, which is a must visit. 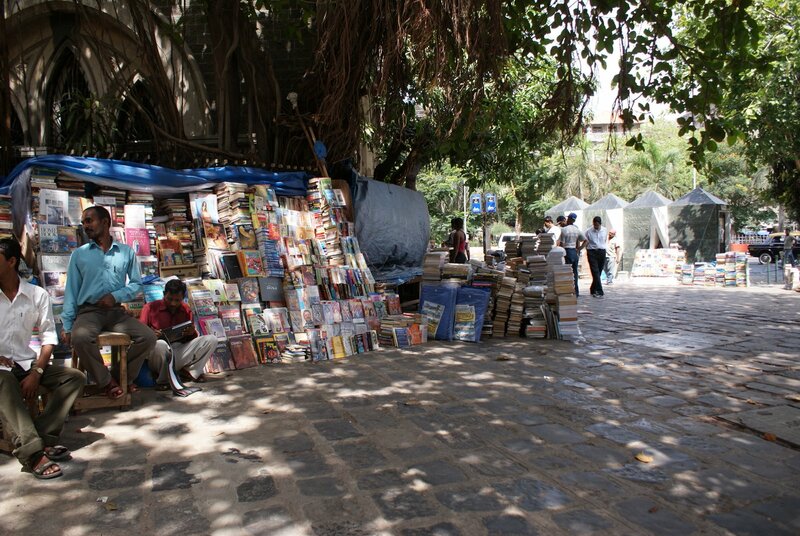 The book fair is usually during January end of February beginning, at the Sunderbai Hall, Near Churchgate. Huge discounts are on the offering in this mania of books. So make it a point to visit it!! Now, if you go straight this will lead you to the American Express Building. Along side the walls of this building are the old book sellers. A few years back they were quite spread out, some of them had shops along the walls of the High Court building also. But now they have been contained in this small pocket here. The sellers here are quite knowledgable about the books that they keep. They know the books by title and author. Some also make it a point to keep the books according to authors. The books most of the times are neatly classified by geners or subjets. They know almost all books by Arthur C Clarke and Carl Sagan. The more popular a book, more are the chances that you might find them here. But sometimes you get jewels here. I got my Why’s of a Philosophical Scrivener by Martin Gardner here. The book sellers also have a library system, which means that after reading the book you can return the book and get some amount back. But who wants to depart with a book, especially if you are a bibliophile? The most common books that you will get here are the novels of all kinds. Bargaining can be done, and you can get books in quite cheap rates, especially if you are a regular. The best time to visit is a late Sunday afternoon. When you can have all the time to browse through endless piles of books, to find what you are searching for. One thing that you might miss on a Sunday is that many of the proper book shops mentioned above including Sterling and Strand, and the Khadi Bhandar are closed on Sundays. But the advantage to go on Sunday is a drastic reduction in the crowd that is present on the weekdays. So if you want to visit them all, the best day is a Saturday. Till last year some sporadic old book shops were also present along the footpaths, of the Old Bombay University Building, the side on the opposite to FabIndia and Globus, near Kala Ghoda end. Here some of the sellers used to sell books for a cheap but fixed price. Some of lots would have Rs. 10/20/30 for a book. Sometimes I have found quite interesting titles here. But recently in a last few months I did not find these stalls. Maybe they were removed from there permanently. I have also found similar shops along walls of the Post and Telegraph Office. But they are not always there. If you are lucky you probably might get them. 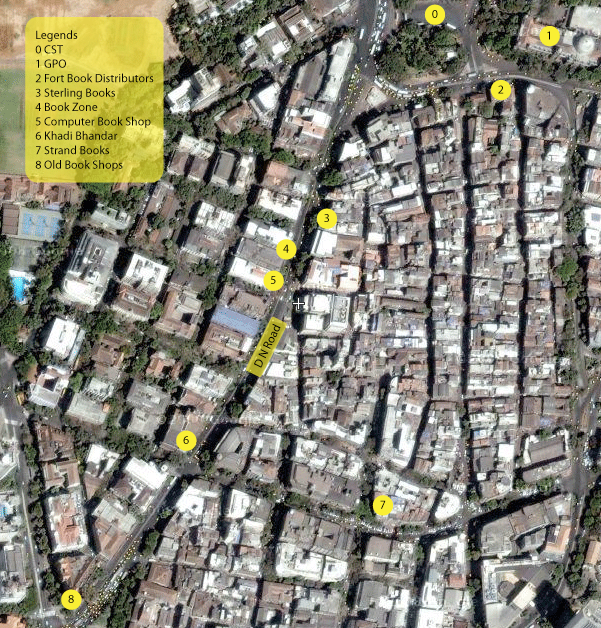 While returning to CST do not forget to visit the Fort Book Distributors, opposite the main entrance to CST [Legend 2 in the map]. This is a unique proper book shop which also sells old/used books at quite cheap prices. They also have exhibition and sales of books at different places in Mumbai, so keep an eye out for them in the newspapers. My last visit to their FBD Book Fair was quite fruitful. So much for the south part of Mumbai. 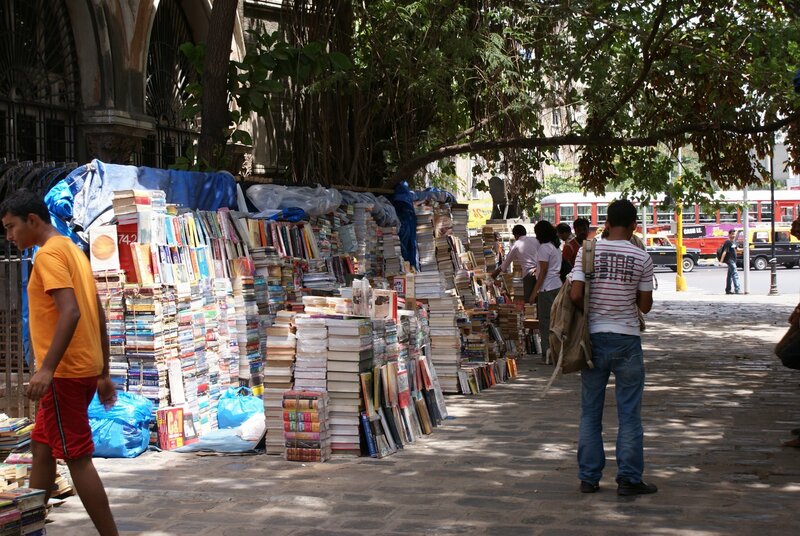 In next post I will cover the Old Book sellers in the so called college district of Mumbai, the Matunga Area. Till then happy book hunting!! Update: As per comment of Square Peg below, I have not mentioned the New and Secondhand Book Shop. Yes! It is there from quite some time if I remember correctly since early days of last century and I did not know about it. For this wonderful shop go to the Metro Cinema Square. There is a shop of musical instruments opposite Metro Cinema [well not exactly opposite, but across the street]. So when you keep your back towards Metro and are standing in front of this Music Store, start walking along the road towards right. After a few shops you have a lane going to left of the road. Just at this corner is the New and Second Hand Book shop. But beware the entrance is a bit small. Two times it happened that I went and saw that the shutters were down so just came back. Third time when I went there, I saw somebody coming out of what I thought was a closed shop. So this is where I discovered the entrance to the shop. They are open till 7 in the evening and closed on sundays. Visiting the shop makes you feel as if you are visiting an old library. The shop has books lined up nicely according to subjects. The shelves have subject labels on them. Browsing through the shelves can, at times, become tedious. The section on social sciences is quite large. You get 30% discount on all the new books. For the old books the prices are mentioned on the cover and on that you get additional 30% discount. Most of the books are more than reasonably priced; they are cheap :). Also don’t forget to visit the second floor also. This entry was posted in bibliophile, books, cst, flora fountain, fort, mumbai, old book shops, old books. used books. old books market, second hand books, sterling, strand. Bookmark the permalink. Thanks for pointing out! Post updated! That was quick! The sports store is called B.X. Furtado and Sons, I remember because I used to buy trophies for our school there almost 25 years ago! Its also strangely enough, a good store for buying or repairing musical instruments. Or at least it used to be.